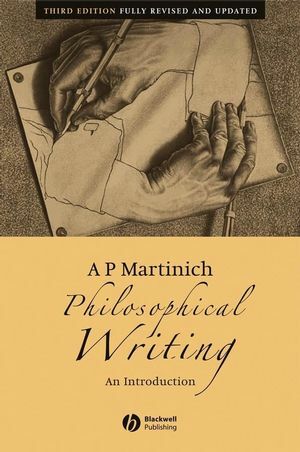 Substantially updated and revised, the third edition of Philosophical Writing is designed to help those with little or no experience in philosophy to think and write successfully. A. P. Martinich is the Roy Allison Vaughan Centennial Professor of Philosophy and Professor of History and Government at the University of Texas at Austin. He is the author or editor of thirteen books, including Hobbes: A Biography (1999), The Philosophy of Language (4th edn., 2001), and A Companion to Analytic Philosophy (Blackwell, 2001). Three Attitudes about Philosophical Method. 2 Logic and Argument for Writing. What is a Good Argument?. The Strength of a Proposition. 3 The Structure of a Philosophical Essay. An Outline of the Structure of a Philosophical Essay. How to Select an Essay Topic. 5 Tactics for Analytic Writing. 6 Some Constraints on Content. 7 Some Goals of Form. The Tail Wagging the Dog. Appendix A: “It’s Sunday Night and I have an Essay Due Monday Morning”. Appendix B: How to Study for a Test. Appendix C: Scholarship: Notes and References. Appendix D: Philosophy Resources on the Internet. Appendix F: Glossary of Philosophical Terms.